The OCAD Zine Library is retiring this blog in favour of our more-frequently-updated blog over here! 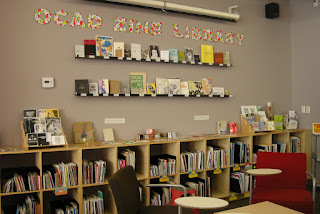 The OCAD Zine Library is housed in the Learning Zone at OCAD University and we will be keeping the Learning Zone blog updated with information about upcoming zine fairs, new additions to the zine collection, ways to access the zine collection in and out of the Learning Zone space and more. 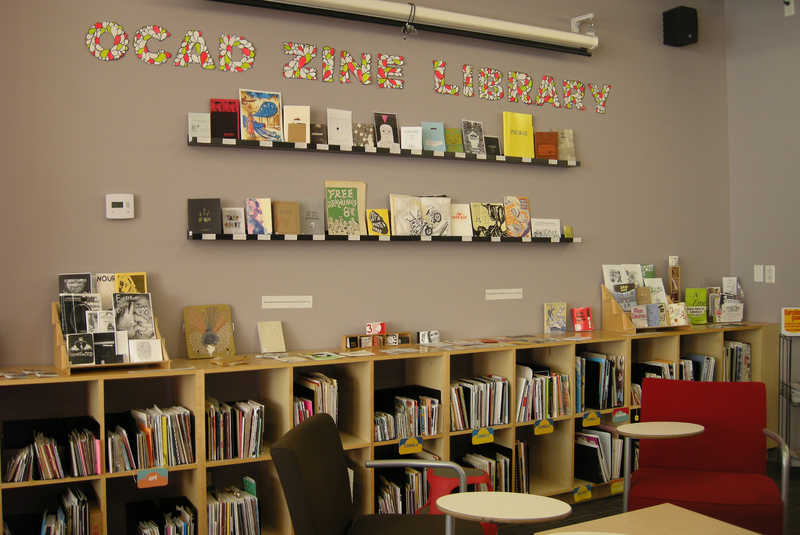 So please pop over to the LZ blog, or follow the OCAD Zine Library on Facebook, to keep up with our activities. 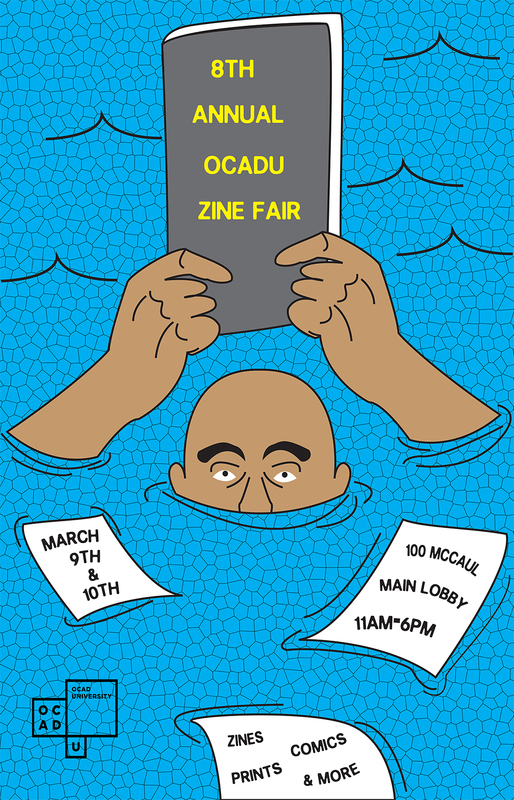 The 8th Annual OCAD U Zine Fair took place March 9th and 10th this year, making this the first year that the fair ran over two days. With different vendors each day, the fair was an opportunity for more students to show and sell the things they make (from zines to comics to buttons to t-shirts) to their fellow students and the general public who show up each year to check out the work of new talent. An initiative of the Learning Zone and the OCAD Zine Library, the fair seems to be more popular every year, hence the expansion to two days. Between both days 45 vendors had an opportunity to share their work. Danielle Leigh is in her second year of the fibre program but she has a growing interest in printmaking. Her zines are about magic, girls and magical girls. Emily studies advertising at OCADU. The two zines they had on display were about bipolar affective disorder and arcade games. The arcade zine was a game in itself, complete with white-out over text that needed to be scratched off to play the game. Keight MacLean is in her last year of illustration with a minor in drawing and painting. The motivation for her zines is making fun stuff (look at that pizza!) and writing about mental health and addiction. One of her zines is about dying her hair and being raised by a witch. Jenn Woodall is in her third year of illustration. She had an amazing array of work with her, including comics, pins, prints and stickers. Her work focuses on powerful, magical women and mental health. Her newest work is a comic about anxiety called Marie and Worrywart. Kai Lumbang is 2nd year graphic design student and a member of the OCADU Zine Collective. He had a packed table which included zines about Kanye West and Cobourg, Ontario. Jennifer Fryer is a 4th year illustration student. Not only was she tabling her prints, zines and stickers, but she also contributed a mini comic and the design of the endpages for the OCADU Zine Collective's self care zine, Take Heart, which debuted (for free!) at the fair. The majority of vendors were students, though a few graduates and artists outside the OCADU community also tabled their wares this year, including graduates Eli Howey & Chu Nap and Toronto creators Naomi Moyer, Matthew Daley and Whitney French. OCADU Zine Fair - now 2 days!! The 8th Annual OCADU Zine Fair is coming up quick. For the first time the fair will last two days! Starting Wednesday March 9th at 11am in the lobby of 100 McCaul and continuing on Thursday March 10th from 11am until 6pm, each day of the fair will feature different tablers and new zines to discover. Every year the the OCADU community comes out for the zine fair and shares more than just zines. You'll find prints, comics, a button making table (proceeds from which will go to building the OCAD Zine Library's collection) and more. This year, the OCADU Zine Collective will be launching its collaborative Self Care for Artists zine at the fair. The zine features stories, tips, artwork and comics about taking care of yourself mentally and physically as an artists. 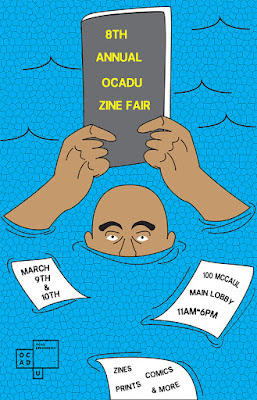 For more information on the 8th Annual OCADU Zine Fair, check out the Facebook event page. The OCAD U Zine Collective will be producing a zine this term about self care for artists and designers. Self care can be defined as any intentional act you take to care for your physical, mental and emotional health. We are interested in all kinds of interpretations of this topic, especially as they relate to the experiences of artists and designers. We will accept images, writing, comics, poems and more from a serious/semi-serious/humorous/critical/any perspective. methods for coping with the specific pressures and anxieties creative people experience, such as deadlines, competition, financial struggles, etc. Each page of the zine will be 8.5 inches x 11 inches in size. Please format your submission to fit this size. Each page of your submission should be submitted as a separate file. Please leave at least a 1/2 inch border on every page, meaning images and text should be centered on the page and no larger than 7.5" x 10". Please provide us with high quality files, with at least 300dpi/ppi resolution. The zine will be printed in two colours on the risograph. This means that each colour will need to be printed separately, one after the other with time to dry in between. If you would like to use both colours in your submissions, you can do one of the following: 1) submit each page as a Photoshop file, with each colour on a separate layer (max. two colours/layers). 2) Submit each colour as a separate PDF file. All of your files should be submitted in grayscale. Please title your files/layers as "lighter colour" and "darker colour" so that we know how you would like the contrast of the image to work. Feel free to email us with any questions you may have about formatting your submission(s) before the deadline. Over at the OCAD Zine Library's Facebook page, in honour of International Zine Month, we've been profiling IZM activities and newly catalogued zines. Here's a selection of zines we've catalogued this month. Colour Coded: queer abstraction meets fruity frosting — a zine/exhibition guide that combines abstract artwork with queer theory by Jamie Q and Ian Phillips. Errol Dynamic — a comic about the redemption of a down-and-out galactic hero by Cory McCallum and Matthew Daley. How To Play Him Off, Keyboard Cat — a zine that lists the tools (including sheet music) for recreating the popular keyboard cat videos by Kristin Cheung. Asexual Feminism — a series of collaborative zines that explore the connections between asexuality and feminism, edited and compiled by Mage. Late Bloomers — a series of screenprinted illustrations of Victorian-era children, many of whom are doubled or twin-like, by Sasha Foster. Stop by during International Zine Month to read these and any of the other 2,000-plus items in our collection. July is fast approaching, which means zine libraries and lovers are gearing up for International Zine Month activities. Alex Wrekk has once again created a calendar of suggested ziney activities for every day of the month. Suggestions include ordering from a zine distro (we suggest Brown Recluse Zine Distro that specializes in zines by people of colour), writing letters to zine makers (there's a letter-writing event coming up at Toronto's first post office on July 14), leaving zines in public for others to find and visiting your local zine library (come see us!). Throughout International Zine Month, the Learning Zone will be open Monday-Friday, 10am-6pm and you can stop by any time to look at our zine collection and make a zine. Just ask a staff member for access to our craft materials. We have lots of collage materials, paper, pencils, staplers and other art supplies for your zine making needs. We will also be profiling a different zine in our collection online every day, so check back regularly throughout July. Seen ghosts at OCAD? Have a feeling we're not alone in this school? Put your experiences to paper by contributing to the first initiative for this iteration of the OCADU Zine Collective! The collective reconvened for the 2014-2015 school year at the beginning of October and, for our first project, we decided to get spooky. Many of us have heard ghost stories from staff who have been at OCAD for years, or students who have felt a creepy presence when working late. 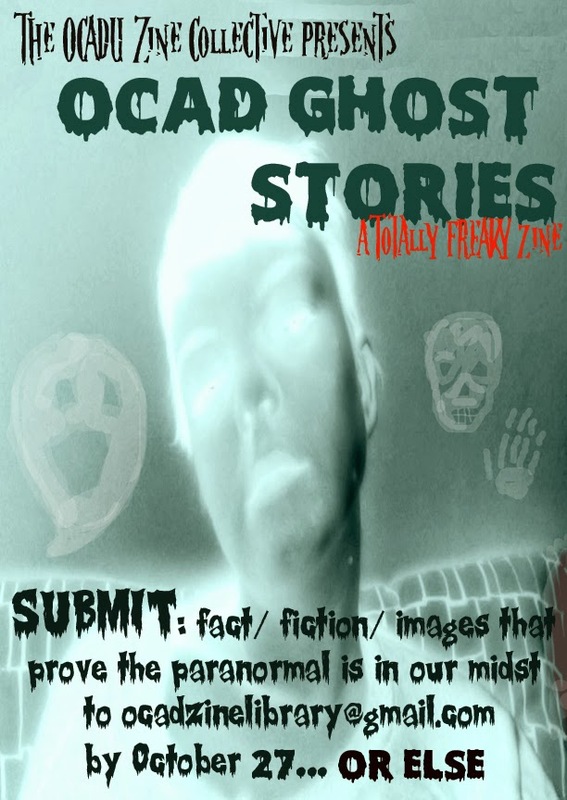 So we're putting together a collection of ghost stories about OCAD. If you need help with ideas, supplies to put together your submission, or just want company while you're working on your contribution, join us on Tuesday, October 21 (at 1pm) for a zine making day in the Learning Zone (main floor, 113 McCaul). 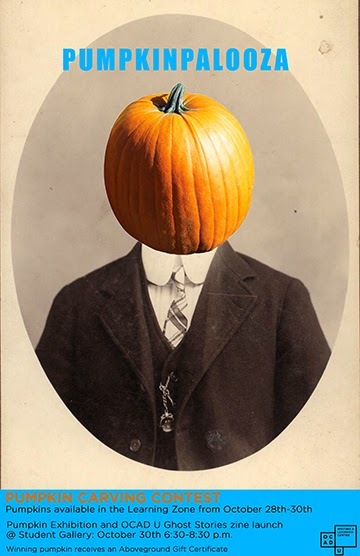 Send your spooky submissions to ocadzinelibrary (at) gmail (dot) com by October 27th. The zine will be released on October 30th at a launch party/pumpkin carving contest in the Student Gallery (52 McCaul). The event (n partnership with the Writing and Learning Centre) will featuring zine readings and a parade of jack-o-lanterns. Costumes are encouraged. You can also take part the pumpkin carving contest by stopping by the Learning Zone from October 28th-30th to get your hands dirty. The winner of the pumpkin carving contest gets an Above Ground gift certificate. 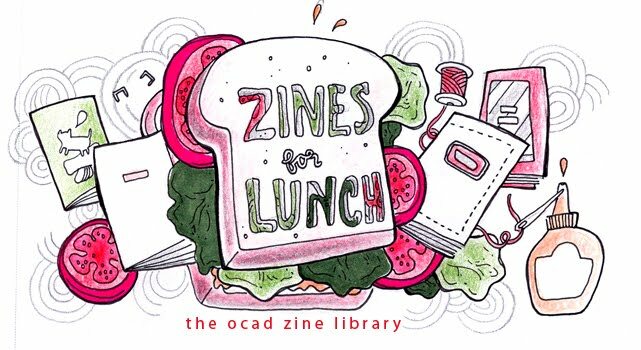 An ever-growing collection of zines created to inspire, educate and entertain, to encourage collaboration between OCAD students and to open up the world of zines for readers and creators everywhere! We are located in the Learning Zone of the Ontario College of Art and Design, 113 McCaul Street, Toronto, Ontario. Come and visit us, or send us an email at ocadzinelibrary@gmail.com!